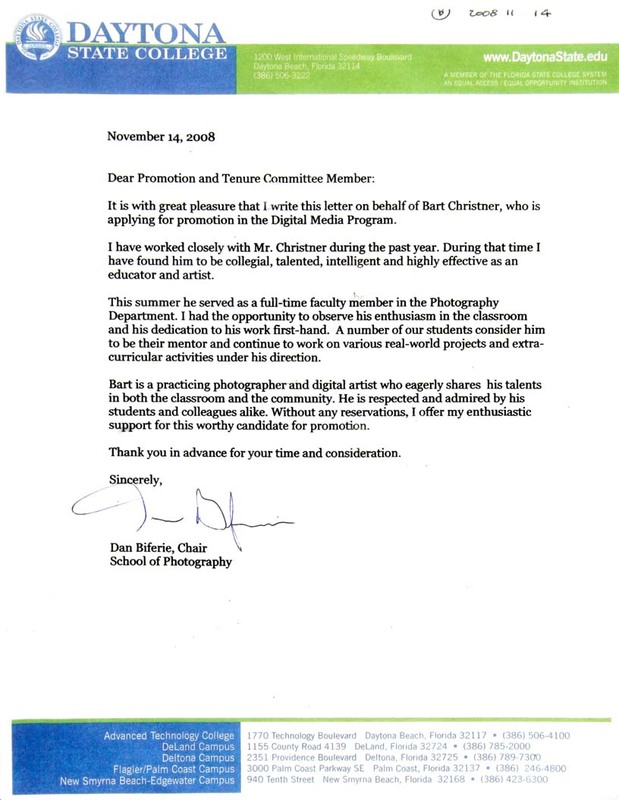 It is with great pleasure that I write this letter on behalf of Bart Christner, who is applying for promotion in the Digital Media Program. I have worked closely with Mr. Christner during the past year. During that time I have found him to be collegial, talented, intelligent and highly effective as an educator and artist. This summer he served as a full-time faculty member in the Photography Department. I had the opportunity to observe his enthusiasm in the classroom and his dedication to his work first-hand. A number of our students consider him to be their mentor and continue to work on various real-world projects and extra-curricular activities under his direction. Bart is a practicing photographer and digital artist who eagerly shares his talents in both the classroom and the community. He is respected and admired by his students and colleagues alike. Without any reservations, I offer my enthusiastic support for this worthy candidate for promotion.